Dennis, I am aware that this is a crucial time for you and, believe me, not only for you but also for me and all your other friends. We are looking at the calendar and February 17, 2005 is the day our eyes get stuck on, the date set for you to pass on to another world, though we all hope that it will not happen. If it does happen, though, you may be sure that we stand by your side. I assure you that I will keep to what I promised you and will see to it that everything is done the way you want it done. Shall we be sad at your demise? We definitely will be sad - no more letters from you, no more encouragement from your side, no more requests written on envelopes and inside letters to smile for you. Smile, however, we will when we remember you and your friendship, though we are sad, I myself am happy to say you have become a big part of my life, a real enrichment, and I will miss you every day like I am now thinking of you every hour day and night. This, Dennis, I think is a dialogue between two people on either side of a line that separates life and death and still is not a dividing line for ever. And I will not forget you as long as I may be on this side of the line, if I should remain here longer than you. And I will put your name on a plaque, so that those who love you may find the place where your remains are resting. Dennis, by now I have four big files with our correspondence, letters and other papers related to you, and if I follow the thread of our friendship back to the beginning, it is like this: In 1997 I by chance discovered a photocopied letter from you sent to Rick Halperin in which you had asked him to find pen-friends for you. You were at the Ellis Unit at that time, where I first visited in 1998 but do not know why I did not visit you then. Anyway, I wrote to you, you wrote back, then I wrote again and a little later sent a Christmas card and you wrote back you did not get my letter. So, probably in 1998 our friendship had not got very far when I first visited at Ellis and I certainly was not on your visitors' list. In 1999 I made the first visit with you shortly after you had been transferred to the then Terrell Unit in Livingston. I ventured a 4-hour special visit, and you then wrote to me saying you would have liked me to come for a second special visit - I do not remember why I did not do that but certaily I was not quite sure about our relationship and friendship, but then I knew that you were one to be closer friends with. Then I came to see you just before they executed my dear friend, my "adopted son" Glen and again after a sleeples night on the morning after they killed him. I could not be much of a support to you because I had to fight back emotion. Then You comforted me "like a brother" and you said that was what brothers are there for, and you had painted a picture for me, painted on a white handkerchief. It was the one that I said I could not put on my walls because the cleaning lady might not like seeing it and might be shocked. It shows a naked man with a wolfhound on a leash beside him. It is well done and I like it and I put it in a frame. I showed it to friends at their home, art teachers, and then a group of students came to their house and they asked me to show them your painting, and they discussed the technique of the piece of art and found it was well done, especially since the painter had not been to any art school and it was all amateur painting; the girls, however, found there was something wrong about the anatomy of the man. But be that as it may be, our friendship then was established. Later you once said that I probably was the brother you had always wanted to have and never got. When they killed Glen, I said to myself I would never again let anybody on death row get that close to me but, in fact, it happened the next morning. Over the past five years I have tried to visit you as often as I possibly could and I enjoyed all my visits and talks with you. They really kept me going. I was impressed by your ways, especially the way you tenderly took care of others, I remember Kevin and now Pablo who were near you and received your help. And I admire your ability to always get back to positive thinking and mood even in or after drab situations like frequent colds, poor food and the loneliness of life in a small concrete cell. Dennis, you are a real brother to me, and to me you are the person that I first met by mail in 1997 and then in person in 1999, nothing else. 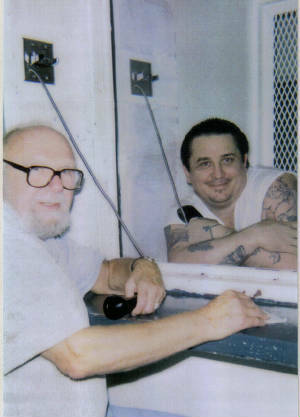 As usual when I first meet a person on death row, I did not check the webpages of TDCJ but was eager to get to know the person that is there now in that particular situation and position. What else people might associate with a person then is of no merit to me. So the Dennis I know is the Dennis that I have known for more than seven years now, and they are what counts. In Genesis Cain asks the Lord: Am I supposed to take care of my brother? Yes, Dennis, I care for you and I will take care of you as best I can, because I love you. I am thinking of you always; hoping you have peace and stay calm, I love you.